JINY Doors has been serving in production and exports of building materials since past 12 years. We have a specialized set of talented teams who manufacture every product with precision to enhance their look and endurance. All our products are manufactured by an experienced team and comply with international standards and are highly appreciated in the international market. The wood doors manufactured by us for the exterior use have a swing style opening and are made up of completely solid wood. The upper surface of the door is coated with high-quality paint which comes in different colors. You can choose the color as per your liking. Bulk orders for the product are always catered on priority with optimum care and precision. Wood doors have a standard size of 2100x900x50mm while the thickness remains 50mm. The doors are made of high-quality wood which makes it durable and ensures it lasts long. All the products we export are CE certified and comes with 2 years of warranty. 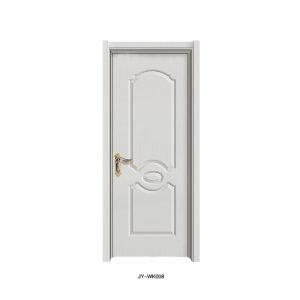 The doors are tough and thus provides high security and the beautiful designs enhance the look of the door. It is easy to install these doors as they come in pre-designed set up for installation.